This is one of those clickable dealies that loads the full-frame shot in a separate page. There, you can read its name is "St. Peter's Catholic Church Kahaluu." No. 1 result. A link to a bunch of eBay kerfuffle. Figures. Next, though, a link to David Sessions' nice collection of travel photos on Worldisround.com from a March, 2004 Hawaii, Big Island trip that includes his own shot of the church. For a nice relaxing desktop journey to the Big Island and a tourist's eye view of "daily driving trips to resorts, state and national parks, and other scenic areas," the index link starts here. Mahalo for sharing, David. An obits page from a 2000 edition of the Honolulu Star-Bulletin follows. The modest place of worship is a popular services spot. Not hard to figure out why. The sunset shot by MLP above is worth a thousand words. Photographer Jan Kaulins' page contains some info on the "little blue church" along with a nicely framed shot. The church, overlooking Kahalu'u Bay, was built in 1889 and its doors never close. This house of God contains less than a dozen wood pews and modest altar. Go inside around sunrise or sunset, and take in the etched glass window at the back of St. Peter by the sea. Leave St. Peter's simple little church a different person. Above, mother of two Kim Lewellen takes a jog, which, clearly, helps her stay in pretty good shape. However, why were they promoting a new episode last week, then, repeating the same episode? After such a terrific episode seven, can't help feeling just a tad bummed about this week, and one of our favorite shows about golf in Hawaii. ...think it can grow in the lava rock? 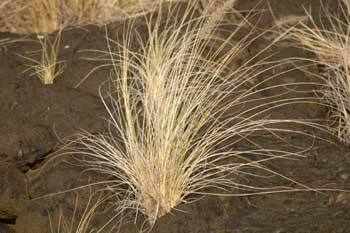 Well, we're impressed by this little tuft 'o grass, making its way through life on the Big Island the only way it knows how. No one ever told the native grass it wasn't supposed to grow in the middle of a hunk of pahoehoe. So, it just did it. There may have been a bunch of other native grasses standing around at the time, jeering at our hero, telling it there was no way. Good thing the plant didn't listen. It wouldn't be here today for us to marvel at and enjoy. Yeah, but where are they going to put the football stadium? In sum, the dispatch states that there are three sites being offered for a second higher education outlet to "complement and compete" with the University of Hawaii at Hilo. Dispatch continues: Right now, there are about 300 studend who attend U-H Center West Hawaii at a fomer shopping center in Kealakekua. in a Palamanui subdivision development. This post is dedicated to nene, the native goose once hunted to near-extinction on the Hawaiian Islands. These nene are alive, well, and free of the hazards of human hunting. (Note tags). You'll find these particular nene at Big Island Country Club, Big Island, Hawaii, where they make up a considerable gallery of birds who, at times, will hoot and honk at your duffed shots on the Pete and Perry Dye track. 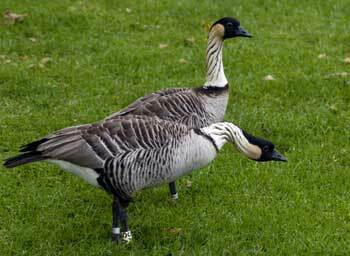 More background about the nene, courtesy of the environmental web site ARKive.org: Nene was adopted as the official bird of Hawaii in 1957, and a notable feature is relatively long legs. These enable nene to go mobile over rugged terrain such as lava fields. Accordingly, they hike about minus the waddle typical of other geese (or, your garden variety tubby cat). Nene, yet another good reason. 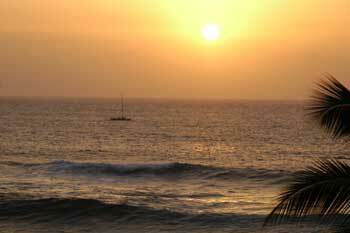 Learn about about a Big Island vacation rental. Don't forget, you're always welcome here. Shouldn't you be going there? Remember, you're always welcome here. Welcome back. "Your dreams are your ticket out." Aloha Airlines is plugging an "inter-island special." First, you have to be lucky enough to already be on one of the islands. Pretty simple after that, for as low as $39 one way,you can fly from one island to the next from June 9 through September 30. Offer includes Kona, natch! Can't move on island time on this one, though. Tickets have to be purchased by April 7. The airline is rolling out classic Funbird colors! Orange was supposedly in when the airline rolled out its Boeing 737s in '69. Read more about it, and check availabilities at the airline of Aloha. Also, don't forget about this special offer. Aw, who gave this guy a golf web gig: call this a recap? Actually, it's pretty comprehensive, but here's the skinny on the 7th installment of the Big Break V (AKA, golf in Hawaii with women who look good, and can play some too) Brought to you by, The Golf Channel (Golf's frickin' home frickin' page!) Screen grabs courtesy TGC. Not to bury the lead, but, the hot Swedish chick is baked. Tossed out like a day old tray of Swedish meatballs. I was hoping that one of the other members of the group would lose. Ashley Prange wins the elimination challenge, and, at this point, is who I suspect takes the whole enchilada. Why? She won last weekend on the Futures Tour in Florida. She's got the game, she's got the 'tude, she's got the mental toughness. She's big, she's strong. Bet she wins it all. Any rate, the elimination challenge covers two spots on the 18th hole, Palmer course at Turtle Bay. (Looks like a fun track, by the way, can't wait to move, get the kama'aina rate). Remaining contestants must play two trouble shots from those spots, high score after that goes home. Everyone finds the green but Kristina, who hits her shot fat, into the bunker, fails to get up and down, and heads into the final location down one to the field. The second is described as an intimidating 178-yard shot over water. A few folk lay up, Kristina can't afford it. Though Aussie Dana leaves her an opening by dipping it into the drink, Kristina can't capitalize, her shot again sounds a tad fat (why, she's so thin? ), it bounces off the rocks, and she's gone. She goes 4, 5 on the two challenges, goes home. And, never let it be said those Scandinavians are cold and unemotional. Kristina is sha-doo-be, uh, shattered, shattered to be making that walk off the course accompanied by the dreary you've-just-been-eliminated-from-the-Big-Break suckah theme music. Planning on bringing your sticks to the Big Island? We recommend a hard shell case. If you're in the market for one, consider an SKB, manufactured in Orange, CA. We've used it starting about five years ago for our first trip to the Big Island, Hawaii. It now proudly bears a number of "inspected with Aloha on the Big Island" stickers, and is still going strong. It's the standard model, but they have all kinds of other ones, including a Big-A deluxe. The manufacturer says all cases include a neoprene o-ring to keep out moisture and the latches are engineered to last a lifetime. We've had no trouble with the case (I once flew with my sticks in one of those soft cases, and, while they arrived in good shape, it wasn't a comfortable feeling, knowing how airline luggage is handled). When we travel, I always managed to wedge in enough of her clubs to play as well (and we rent a day bag for her at the clubs) and there's even enough room left to include a few bags of her prized 100 percent Kona coffee for the trip home. Don't want to deal with the baggage issue: Most golf resort destinations rent, and there are enough local golf shops around that will also rent for a lower rate than the resorts. Might want to consider that, especially if you're in the market for a new set of sticks and want to test out a manufacturer under "battle conditions."